Kitchen Kleen Potatoes - grown by Nuto Farms - are certified "Environmentally Grown" by the Midwest Food Alliance, a non-profit organization that provides third-party approval of farms that grow food in environmentally and socially responsible ways. Food Alliance's Midwest Affiliate promotes the expanded use of sustainable farming practices by recognizing farmers who produce food in environmentally friendly and socially responsible ways through our certification program. We also educate consumers about the benefits of sustainable agriculture. Food Alliance certified farmers share common guiding principles. When a consumer purchases our potatoes, he/she knows they are buying a healthy food and supporting a farm that protects the environment and provides safe and fair working conditions for employees. We rely on nature’s bounty to bring our product to thousands of families across the Midwest. Our direct connection to the earth’s resources reinforces our longstanding commitment to stewardship and responsible operation. Our environmentally friendly growing methods help to ensure a safe wholesome product for consumers and a continued reduction in our overall carbon footprint. We have implemented many initiatives that have cut down on our use of energy, water, and materials also save us money. That translates into what is good for the environment is also good for our business. We continue to be involved with Food Alliance Midwest, a nationally recognized certifying organization for environmentally friendly and socially responsible agricultural practices. Through this cooperative effort, we are able to continually find new ways to grow crops using natural pest controls, weather monitoring and scouting. The long-time goals of Food Alliance Midwest partners are to provide quality locally grown products to consumers that continually reduce the impact on the environment. The potatoes grown on our farms are part of a larger operation involving corn and soybeans. These crops grown in rotation with potatoes, allow us to break disease and pest cycles naturally, reducing pesticides and fertilizer use, creating a more wholesome product and less impact on the environment. We apply fertilizer to ensure vigorous plant growth and abundant yields without leaching into groundwater or washing off into nearby waterways. As fertilizer and seed costs increase, soil testing and continued research into new growing methods are an integral part in our sustainable farming practices. Water usage is becoming a hot topic in today’s agriculture. At Kitchen Kleen, nearly all of our irrigation systems have been updated to low pressure systems to reduce evaporation. Through these changes, water usage can be reduced by up to one-third. Constant weather monitoring and on-hand moisture testing eliminates over watering to prevent wasting this precious resource. New technology, such as variable speed planting and fertilizing equipment, helps to reduce seed and fertilizer use on non-irrigated land. The satellite guidance systems on machinery, reduces overlap, saving fuel and other non-renewable resources. Our goal is to continue to reduce the impact of our total operation on the environment to maintain a sustainable business for future generations. Our planting season begins the end of April with two-to-three ounce potato seed pieces. It takes approximately 2,000 pounds of potato seed to plant one acre of potatoes. One acre of potatoes on average yields 50,000 pounds of potatoes. While continually searching for new high-tech advances, Kitchen Kleen, stresses natural controls rather than a reliance on chemicals and fertilizers. This "green" agriculture was practiced and perfected by Nuto Farms long before it became politically correct. The use of additional cultivation to eliminate weeds and rotating potatoes with corn, clover and soybeans reduces the chemical and fertilizer use while improving tilth, health and fertility of the soil. This attention to detail guarantees a consistent crop. correctly forecasts soil moisture demands. 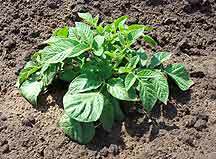 Proper soil moisture is extremely important for a uniformly shaped, high quality potato. When Kitchen Kleen Potatoes are ready for harvest, state-of-the-art equipment is used to eliminate bruising once the potato leaves the ground. All loads are covered with tarps when necessary to protect the freshly dug potatoes from adverse weather conditions on their way to the warehouse. A mechanical potato or the "Smart Spud" is also used to measure the softness of ride from the field to the bag -- a potato that's handled gently keeps better and performs better when used. 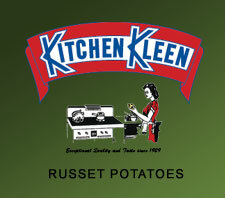 Kitchen Kleen Potatoes are kept at a computer controlled temperature and humidity level throughout the winter. Once the potatoes have reached the proper temperature, they are removed from storage and brought to the packing shed where they are washed, not once, but twice. Once our potatoes reach the packing shed they go through a series of inspection stations to ensure only the finest potatoes reach Kitchen Kleen bags. Our potatoes are packed and available from October through June each year.